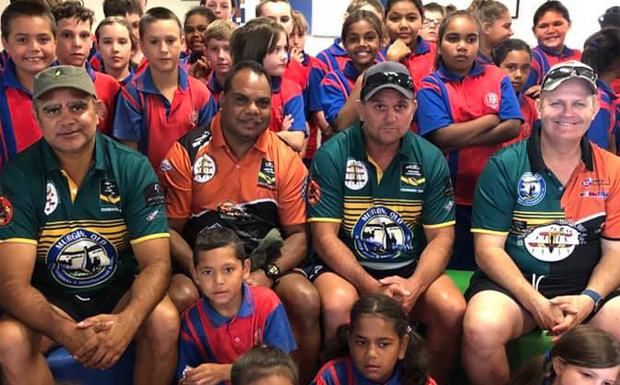 International Legends of Rugby League tour organiser Troy Byers and players Nathan Blacklock, Leo Dynevor, Craig Teevan and Terry Matterson have been busy over the past few days with a host of engagements to raise awareness about the big clash between the Cherbourg Hornets Legends and the Australian NRL Legends. 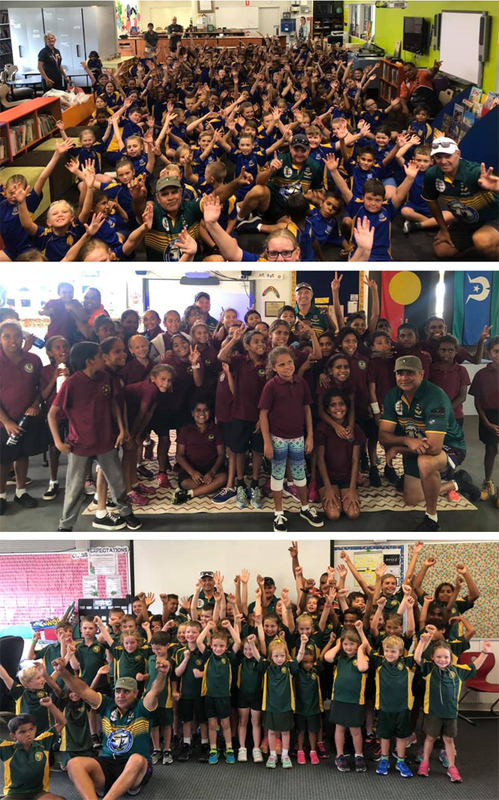 The four have been visiting schools, fielding radio interviews, playing golf and generally spreading the message throughout the Cherbourg and Murgon areas. Troy said two more players had been added to the Australian Legends line-up since the last list southburnett.com.au printed, ie. Scott Hill and Manly legend Cliff Lyons. The only other possible change was a question mark – understandably – over former NQ Cowboy Matt Bowen who lives in Townsville, hard hit by floods. The Legends of Rugby League excitement will continue to build on Friday afternoon. Fans will be able to meet the players (and collect autographs) at a special community afternoon being held at the Cherbourg Sports Centre from 4:00pm to 7:00pm, organised by Cherbourg Council. The big day of rugby league action will get under way at 9:30am at Jack O’Chin Oval with junior games involving youngsters from Murgon, Wondai and Cherbourg. This well be followed by a Primary School game between Cherbourg and Murgon; and a High School game between Murgon and Kingaroy. Coaching Staff: Frank Malone, Arnold Murray, Warren Collins, Duncan Cobbo, Errol Simpson, Eric Law, Henry Hegarty, Stan Murray, Noel Georgetown, Ken Bone, Gordron Wragge, Les Wragge, Simon Fisher, Laurie Bond and Peter Carlo.